giving youth the tools and freedom to be creative. Learn about our commitment and how you can help. Welcome to STUDENT ARTS FOUNDATION! USING ART & EDUCATON TO BUILD A PRODUCTIVE COMMUNITY. STUDENT ARTS FOUNDATION INC. provides students of all levels opportunities and resources to support their creative interests. We enable students to explore and expand access to alternative methods of engaging activities in an effort to keep our youth positively active and off the streets. We organize art-centered community outreach programs and events, where students can acquire new skills and grow their artistic passions into real-world endeavors. GIVING OUR YOUTH THE RESOURCES AND OPPORTUNITIES TO FOSTER THEIR CREATIVE TALENTS. Student Arts Foundation partners with local communities, businesses, and schools through organized events to inspire and empower youth through artistic expression. Our foundation ultimately seeks to provide academic scholarships for students looking to pursue higher education within an artistic field on interest. We work to spark creative passions in young adults, helping them to transition their interests towards realistic and achievable career goals. THE DIVERSE WORLD OF THE ARTS! The arts are far more than simply drawing and painting. The Merriam-Webster Dictionary defines art as "something that is created with imagination and skill, that is beautiful or that expresses important ideas or feelings." Art comes in many forms and manifestations: Visual, Performance, Music, Culinary, and Fashion, to name but a few. 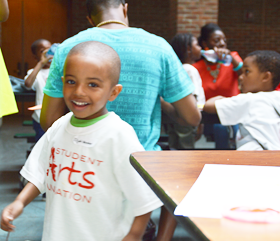 Our organization focuses on helping students explore a wide variety of art-related fields. Students then are able to take their unique artistic vision and channel it through higher education and training toward a fruitful and rewarding career. We seek to support our students throughout their journey, from first exposure through providing gateways to future career opportunities.